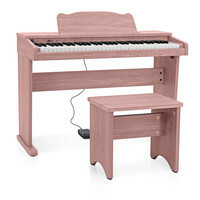 The JDP-1 Junior Piano in pink is a genuine digital piano redesigned to a smaller scale ideal for children. The piano provides a positive fun playing experience for children and the USB connectivity means it can be used with a number of modern music apps. Simple compact and fun this piano allows kids to experience the excitement of music. It comes highly recommended by music teachers as an ideal starter instrument for younger players. It comes with a matching coloured bench and sustain pedal so beginners have everything they need to get playing straight away. This entry was posted in Gear4Music and tagged Keyboards-and-Pianos. Bookmark the permalink.